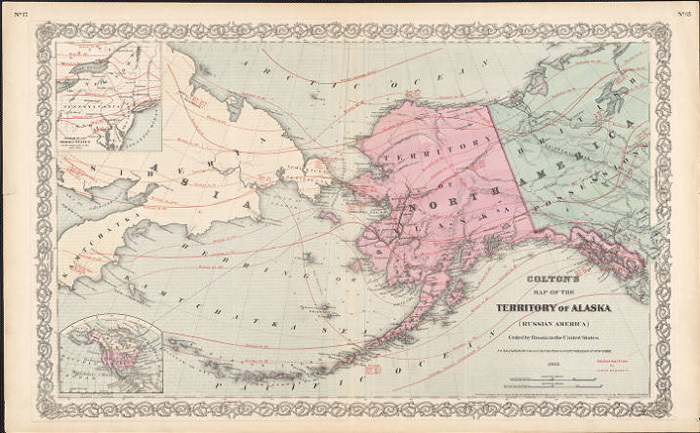 For more than 30 years, Russia stood alone in control of Alaska and the northern seas. They had the rich fur trade all to themselves. That changed in the 1770s when explorers of other countries began to enter the North Pacific. Spain was the first power to arrive. It turned out that Britain and the new American republic became Russia's greatest challengers. In the late 1770s, British Captain James Cook sailed north. His mission was to find an ice-free passage from the Pacific to the Atlantic. He didn't find the famed Northwest Passage, but his trip produced the first reliable charts of the Northwest Coast. In May 1778, Cook reached the bay now known as Cook Inlet, site of modern Anchorage. There he realized the waterway ended. He named that portion of the inlet Turnagain Arm because he had to turn around once again. He noted in his journal the region's promise for the fur trade. He also said that unless they could find a passage to the Atlantic, he didn't think the region would be of much value for Britain. It was just too far away. He kept searching for the phantom passage. He sailed through the Bering Strait, but ice in the Chukchi Sea stopped him. He then turned south and spent two months charting the Aleutian Islands. When that was complete, he sailed for Hawaii, where he was killed by Polynesian Natives. Cook's crew returned to Alaska for one more try to find a northern passage to the Atlantic, but failed. They sailed for England via the China Sea. When they stopped in Canton to trade some of their sea otter furs for supplies, they couldn't believe how much the furs were worth. It turned out Cook had been wrong about the value of the fur trade. Russia's fur trade was no longer a secret. Other nations and ships soon followed the British. They weren't just looking for furs. One of the most famous explorers was George Vancouver. He had sailed with Cook on his last voyage. Vancouver returned to Alaska as captain of his own expedition from 1791 and 1795. Vancouver was the first to provide detailed charts of the Inside Passage. He was also the first European to sight from Cook Inlet distant stupendous mountains covered with snow. He had just spotted what is now known as Mount Foraker and nearby Mount McKinley, the continent's highest peak. By 1805, at least 200 European scientific and commercial voyages had been made up the Northwest Coast. Russians, British, Americans, Spanish, and French all came to see what they could find and claim for their countries. The Spanish launched 13 voyages between 1774 and 1793 to reassert Spain's claims to the Pacific Coast. Some expeditions pushed as far as Prince William Sound and the Aleutians. Valdez, Malaspina Glacier, and Revillagigedo Island, where Ketchikan is located, are just a few names that resulted from the Spanish trips to Alaska. Most tragic of the early expeditions was that of Jean Franois Galaup de la Perouse, master of the French vessel Boussole. In July 1786, the ship visited Lituya Bay near Yakutat. Two of the ship's small boats were trying to chart the bay's mouth when they were caught in violent rip tides. All 21 crewmen and the boats were lost. Later, the expedition's second-in-command and nine others were killed by natives in Samoa. Their troubles did not end there. La Perouse, along with the Boussole and his remaining crew, disappeared in a 1788 typhoon in the Southwest Pacific. Adapted with permission from In the Russians' Wake: British and French Explorers and "Malaspina and the Spanish Incursions" chapters in Alaska's History by Harry Ritter, Alaska Northwest Books, 1993. Dictionary of Alaska Place Names, Donald J. Orth, USGS, 1971. Explorers of Alaska by John David Ragan, Chelsea House Publishers, 1991.